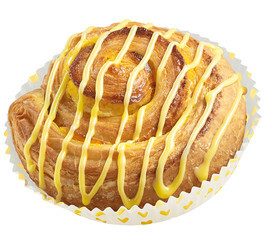 Flaky Danish pastry roll with fresh lemon filling. Preparation: Place the product in paper cup. Thaw for 15-30 minu,tes. Bake at 180-190 ° C for 18-20 min (convection oven) or at,200-220 ° C (regular oven). WHEAT flour (contains ascorbic acid), vegetable fat/oil (palm*,rapeseed), water, sugar, EGG, yeast, semolina (WHEAT), modifiedstarch, skimmed MILK powder, lemon juice, WHEAT GLUTEN, lemon zest, salt, dried sourdough of WHEAT, emulsifier (E471, E472e), malted WHEAT flour, maltodextrin, dextrose, aroma (incl. lemon, orange, vanillin), coloring (beta carotene), antioxidant (E300, E330), DURUM WHEAT flour. *Certified by RSPO Frosting: Sugar, water, glucose syrup, rapeseed oil, natural aroma (lemon), emulsifier E471, coloring (beta carotene).